The Jupiter Police Department is attempting to identify the individuals who may be responsible for the theft of custom rods and reels from a docked vessel that occurred on July 2, 2018 around 2:00 a.m. in the area of 1000 North U.S. Highway 1. 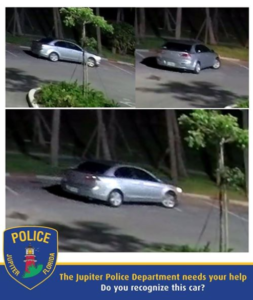 The suspects then left the area in a silver vehicle as shown in these photos. The stolen rods are customized with “Reel Lucky” printed on them.